The Ruffwear Kibble Kaddie is a travel friendly dog food storage container. 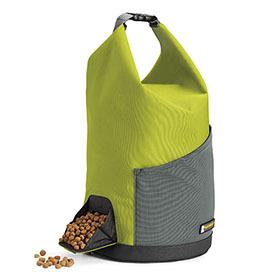 Compact & convenient design allows for easy carrying, storage and dispensing of kibble. The top-loading, roll-down closure secures contents and folds as dog food is used.. Kibble is dispensed through the side-mounted food chute. External stash pocket fits collapsible bowls and other adventure essentials. Capacity:42 cups. Roll-down top closure is secure. To Clean: Hand wash with dish soap. Air dry.